A number of incidents leading up to the arrest occurred on the night of New Year’s Eve. AN INTERNAL GARDA investigation is under way to examine the circumstances surrounding the arrest of a garda recruit in the Leinster area over the Christmas period. The probe was launched by senior officers in the district to ascertain the full details of the incident after suspicions were raised that the recruit was arrested for alleged drink driving but not dealt with appropriately. It is understood that following his arrest on New Year’s Eve, the man was taken home from the station by colleagues before the correct procedures were followed in relation to drink driving suspicions. TheJournal.ie understands that the off-duty garda recruit – who has been an officer for more than a year – was socialising with friends when he was involved in an altercation in a pub. 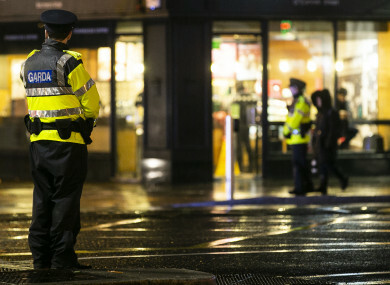 The incident spilled out into the street where the officer was met by gardaí from his station. They defused the situation and brought the man home. According to sources, however, the recruit attempted to return to the scene but allegedly crashed his vehicle into a nearby tree. A different garda unit spotted the incident and the man was arrested on suspicion of drink driving. He was brought to a local garda station where a sergeant processed his arrest. The recruit was detained but when the sergeant took a break from duty, the first police unit – which had earlier taken him home – allegedly drove him home again. On his return to the station and realising that due process had not been followed, the garda sergeant rearrested the recruit at his house. The current internal investigation will examine the work of a number of gardaí who were working on New Year’s Eve, not just the drink driving suspect. Under the Road Traffic Act, a person is arrested for drink driving after they fail a roadside breath test. They are then brought to the nearest garda station with an intoxilator machine – of which there are about 90 nationwide. An evidential breath sample is taken and if a person fails, they are then charged with the offence of drink driving. While the charge and bail is being processed, the accused is supposed to be placed in a holding cell. It is not known at this time if the recruit’s arrest was fully processed before the first police unit brought him home for a second time. The Garda Press Office, when given extensive details on the allegations, confirmed that it is investigating an incident of drink driving. Gsoc said it had not received a referral in relation to the case but added that incidents such as a recruit drink driving would usually be dealt with internally in An Garda Síochána. Email “Garda unit investigated over how it dealt with arrest of alleged drink driving recruit ”. Feedback on “Garda unit investigated over how it dealt with arrest of alleged drink driving recruit ”.